The calendar says it’s the middle of April. Old Man Winter tells me he’s not giving up easy. A STRONG north wind is blowing here in Eastern Nebraska, and snow is still potentially in the forecast. If you’re a watcher of Facebook pages, you’ve been seeing the recent posts about harvesters tuning up their equipment and sharing their anticipation of the 2018 harvest season. Seems everyone is ready to head south to cut wheat. If you haven’t seen these images, be sure to visit the North American Custom Harvesters and HarvestHER pages. Both pages are kept up to date with the journey of the custom harvesters’ movement south to north. I believe it would be safe to say the anticipation of the 2018 harvest is shared with plenty of concern. Harvesters begin focusing on the next season shortly after the previous one has finished. It’s the end of the year that forces many to make decisions about the next season before anyone can know for sure what is in store. And, even when we THINK we know, it’s not until the combine gets in the field do we truly know what we’re looking at. Equipment purchases and trades are usually made before December 31 for tax purposes. This is all done with the hope the next harvest will be one that can justify the dollars spent. Some people who don’t fully understand why we do what we do will criticize the harvester for trading every year or every other year. They don’t take into consideration the number of acres our combines see in a season AND the fact that we’re on the road. Who wants to be sitting in a ripe wheat field with a down combine and black storm clouds on the horizon? Last summer, my husband Jim and I made the decision to run our combine a third year. This meant more money was spent on repairs than if we had traded it the year before. This year, we sat down before the end of the year and discussed our options. There was no way we could do a fourth year…unless we just knew it meant more repairs. Could the amount of money on repairs justify the amount of money it was going to cost to trade? We know we will never see the day our combine is completely paid off so we try to justify the payments. Can we make it work? Well, we could if this would happen or if this doesn’t happen. So, it’s a gamble. Much the same as it is for anyone involved with agriculture. The other option is one that I’m not wanting to face and, yet, know it will happen one day – selling out. It all comes down to whether or not we feel we’re up for the game again. I guess we’re up for the game for at least a couple more years. We chose to make the trade and have no other option, at this point, except to get ready to head south and hope we have a job to head for. Once we get through the month of February, spring takes on a speed like we haven’t seen all winter. All at once, it’s the first of April. This means in two more months, most custom harvesters will be in the wheat fields of the southern states. Or, so we hope. There is concern, again, about what the summer holds for most of us. If we just had a crystal ball, right? The main concern going into the 2018 wheat harvest is, again, drought – in Texas, Oklahoma, Kansas, Colorado and Nebraska. We saw what drought could do to the industry last summer when many harvesters lost thousands of acres of crop in the Northern states. The summer harvest ended for most mid-season. Harvesters had to make the tough decision to call it quits early and went home. No crops, no income and still making equipment payments and paying for labor who were sitting with nothing to keep them busy. According to the USDA, 65% of wheat in Texas was in poor to very poor condition while 72% of topsoil moisture across the state was short to very short. Moderate and Extreme drought was expanded in central and parts of southern Texas. Precipitation continues to miss western Oklahoma where 28-day streamflows are running below the fifth percentile and precipitation for the last 6-months is around 20 percent of normal. Extreme drought was expanded to cover more of the Panhandle of Oklahoma, reaching into Kansas and Texas. Aside from Kansas and Colorado, precipitation during the past 30-days was just ahead of normal as surpluses of 0.50 to 1 inch fell in much of North Dakota, eastern South Dakota and eastern Nebraska. Winter wheat conditions were rated 49 percent poor to very poor in Kansas while 69 percent of topsoil moisture across the state was short to very short. In southern Kansas, 180-day precipitation departures are 4-8 inches below normal. In southwestern South Dakota, recent precipitation allowed for D0 and D1 to be contracted. Severe drought (D2) was contracted in west central Colorado and in the Dakotas. 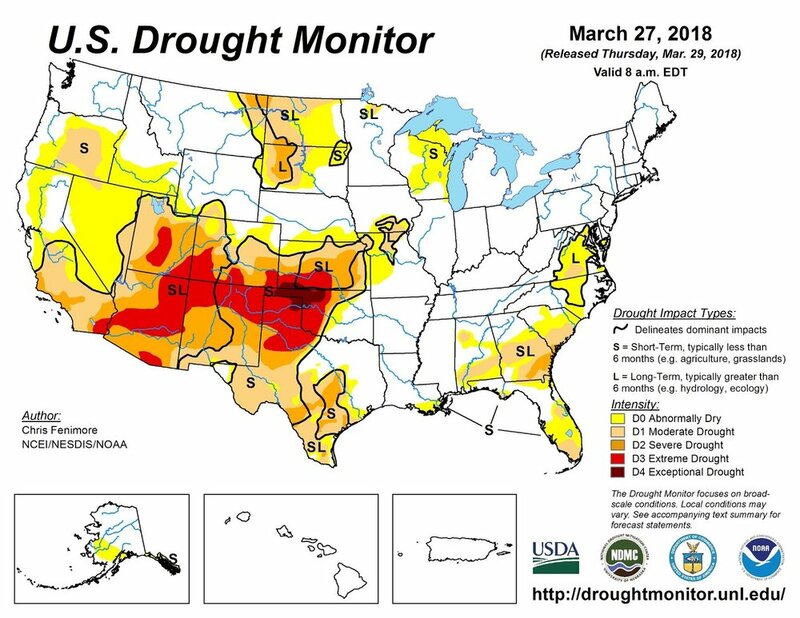 Extreme drought (D3) was expanded southern and western Colorado and southern Kansas. Some felt it just wasn’t worth the gamble and stress and won’t be returning for the 2018 harvest. Is the industry concerned? I am willing to bet the answer would be yes. The 2018 wheat planting projection is at 47.3 million acres which is up 3% of the 2017 planting. However, this is still the second lowest wheat acres planted on record since the U.S. began keeping records in 1919. Add this to the weather issue and we’ve got a few harvesters going into this new harvest season with anticipation for the best but knowing they better have a plan B in place (if there is such a thing). Last summer, our final head of wheat was cut in Chadron, Nebraska on July 17…at least a month and a half earlier than it should have been. And it wasn’t just us. We count on the wheat to make it all work. We can’t afford to sit idle that long without major problems arising. The custom harvester cannot survive on fall crops alone. And there are a lot of wheat acres being turned into corn, soybeans and cotton – all fall crops. The custom harvester is a unique segment of agriculture. We’ll keep doing what we’re used to doing and continue taking the risk as long as we can. We begin getting the itch of being on the road mid-May with hopes there will be wheat to cut and a job to go to. We do this because it’s who we are. It’s what we do. Will the concern continue? Oh yes…much like a pregnant mama – those concerns will be there until the end. And when it’s finally over, we’ll look back wondering what the heck just happened and yet feel blessed. I hope…gotta keep the hope! Life on the road as a third generation harvester has provided Tracy and her family with memories and adventures while following the ripening wheat from south to north. Although this lifestyle has not always been easiest, it created a tight family unit, provided a way to be involved in agriculture and a reason to travel the Midwest. Tracy writes about the experiences of being on the road on her blog, NebraskaWheatie.com.